SEATTLE – They’ve won 11 games in a row and are 9-0 in conference play. They are 18-4 overall and have no truly glaring loss. Fourth-ranked Gonzaga needed a last-second jumper to beat them in Spokane, and yet the Huskies are still outside the AP Top 25 men’s basketball poll. Fans likely are upset by this. Players and coaches may feel snubbed. Unfortunately, there isn’t a whole lot of room to complain. The Pac-12 did this to itself. To be clear, I would put the Huskies at No. 25 if I had a vote. I’m not sure if they’re better than 24th-ranked Maryland (17-6), but seeing as how the Terps have lost three of their past four, I’d remove them from the rankings. But I can certainly see the logic in leaving out UW, which received the most points among unranked teams. I’m not sure there’s a chemical out there that could remove the current stain from this conference’s reputation. We all saw what happened in the NCAA Tournament last year. Eleventh-seeded Arizona State lost its play-in game to Syracuse, 11th-seeded UCLA lost its play-in game to St. Bonaventure and fourth-seeded Arizona lost its first-round game by 21 points to Buffalo, which lost by 20 two days later. Should you punish a conference for a down year in the previous season? Not necessarily. But then again, the big nonconference wins this year are pretty sparse. Yes, Arizona State beat No. 13 Kansas and previously ranked Mississippi State. And yes, Arizona beat No. 17 Iowa State in November, although the Cyclones were without their third-leading scorer, Lindell Wigginton. Other than that, it’s a win over Nebraska Omaha here, a win over Georgia Southern there – a who’s not who of notable victories. This already has become a concern in football, in which Pac-12 teams have struggled vs. powerful programs outside their time zones. The conference was left out of the College Football Playoff for the second consecutive year, and Washington was the lone team to play in a prestigious bowl game. But now that shoddy national perception has bled over to the hardwood. It didn’t help that Saturday’s Washington-UCLA game shown on ESPN2 featured 29 turnovers in the first half. If the Pac-12 regular-season champion also wins the Pac-12 Tournament, it’s entirely possible the committee picks only one conference team to go to the NCAAs. None of this should affect the zeal Washington fans have displayed toward the Huskies recently. UW deserved every fan it got for Saturday’s sellout, and when Hec Ed is rocking, it’s one of the more vibrant basketball atmospheres on the West Coast. But you certainly can’t blame voters for any skepticism they have toward the Pac-12. It might call itself the conference of champions, but it hasn’t been the conference of a national men’s basketball champion in more than 20 years. Of course, this could all change in the not-so-distant future. According to 24/7 Sports, Arizona has the nation’s top recruiting class for 2019, while USC is third and Oregon eighth. Washington, meanwhile, is ranked 19th after getting an oral commitment from five-star recruit Isaiah Stewart, and given what coach Mike Hopkins has been able to do in his first two seasons here, there’s no reason to think the Huskies won’t contend. But these are all just hypotheticals. 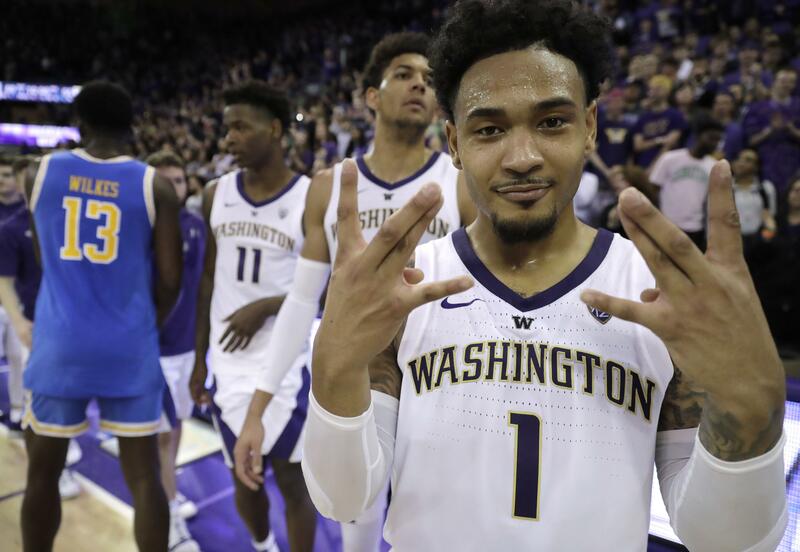 It wasn’t long ago that Washington was landing top-10 recruiting classes, only to fall well shy of making the Big Dance. Until people actually see the results on the floor, I imagine they’ll remain cynical. All this said, I don’t think someone such as Hopkins cares one lick about where his team is ranked. He might even prefer to be left out for motivational purposes. But I do think that he and every other Pac-12 coach, player or fan cares about the perception of their conference. Based on this week’s rankings, that perception is clearly weak. Published: Feb. 5, 2019, 5:21 p.m. Updated: Feb. 5, 2019, 6:20 p.m.